Last week, the National Brain Tumor Society announced a partnership with the Global Coalition for Adaptive Research (GCAR), a nonprofit organization comprised of some of the world's foremost clinical, translational, and basic science investigators. 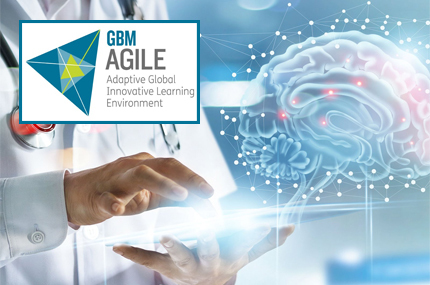 NBTS has provided GCAR with a $750,000 award to help launch and build patient awareness of the world's first global "adaptive" clinical trial for brain cancer, GBM AGILE (Glioblastoma Adaptive Global Innovative Learning Environment). Read the full GBM AGILE news release. Sarah is founder and CEO of Big Duck, a consulting agency in Brooklyn, NY specializing in helping nonprofits develop strong brands and communications. Sarah has been a long-time supporter of NBTS, has been on the board for at least 6 years, and served as Vice Chair for the last two years. Register Now for Spring Events! It's a new year and people from all over the country are coming together to walk, ride, plunge, and race to raise funds for research! Join us at one of our signature events or create your own community event in your neighborhood, town, or city. It's a great way to meet other patients and caregivers, share your experiences, and work together to find new treatments and a cure. Join NBTS for some fun at historic Fenway Park, Sunday, 4/28! With a portion of the proceeds benefiting NBTS, get your seats today and cheer on the World Champion Boston Red Sox. Children 14 and under will also have the opportunity to run the bases following the game (weather permitting). What should the brain tumor community hope and watch for in the coming year? We've reached out to some of the leading experts in the brain tumor scientific and medical field to get their thoughts, forecasts, and hopes for brain tumor research and treatment development in 2019. In honor of Meredith Lindberg's 5-year-old daughter who is battling a brain tumor, this year's Rhode Island Brain Tumor Walk will take place on Sunday, 4/14. Meredith has a goal of raising funds for research to aid in the fight against brain tumors! Join Meredith and her community for a day of food, music, fun, and walking for a cure!